Truth be told, Manitoba’s film industry is booming. The province’s total film production volume reached $210 million between April and December last year – the first time it has ever cracked the $200 million mark in a year. To put that in perspective, the production volume in 2008/2009 was just over $61 million, according to Manitoba Film and Music (MFM), the crown agency charged with growing the local industry. The organization says the last two years have been a tipping point for our province’s film and music production. One of the latest signs of success for Manitoba’s film and TV industry is the hit CBC Television series Burden of Truth which, now in its second season, has set up production in and around Winnipeg. It’s co-produced by Eagle Vision, the very successful Winnipeg production company headed by Lisa Meeches and Kyle Irving. The company’s film credits include Blue State, Lovesick and the academy award-winning Capote, as well as original TV shows Taken and Ice Road Truckers. Recently, Economic Development Winnipeg and Tourism Winnipeg got a chance to meet the stars and producers of Burden of Truth, who were happy to talk about their love of Winnipeg and the film industry here. In this post, we sit down with Winnipeg-born Kyle Irving and ask him about the strength of Winnipeg and Manitoba as a film and TV production centre. EDW: Burden of Truth is both shot in Manitoba and takes place here, which is a bit of a rarity. How did that come to be? KI: Burden of Truth is a project that one of our long-term partners, Entertainment One, was looking for a home for and thought it might be a good fit for here. We started the process of introducing the creative team to this place to decide whether or not the story they wanted to tell would fit into Manitoba. We were confident this was the right place. The next thing you know we’re off the races, and we’ve got a homegrown series being made and set in Manitoba. EDW: Why Winnipeg and Manitoba? What is it about this place that makes it great for film and TV production? KI: I think the thing that brings people here first is the tax credit structure, the incentives that are on the table from our extremely supportive provincial government. That gets people in the door and gets the conversation started. You’re also going to get access to a community that’s supportive of the industry. The support for Eagle Vision since the time we’ve been working in this community has come through probably the greatest champion for the industry in Carol Vivier, the CEO for Manitoba Film and Music and Film Commissioner. She is the captain of a ship that’s taken an industry from half a million dollars a year to in excess of $200 million a year in production. She’s been at the helm the whole time. EDW: Talk about working with government, industry and business owners when you’re filming here. What’s the experience like? KI: Our ability to work with both the community and the government to shoot almost wherever a production needs to go is unique and unlike any other community. Getting to shoot in the Legislative Building, the Law Courts, or being able to negotiate deals with business owners is incredibly beneficial to the quality of production that you end up with. The good will in the greater community of Winnipeg and Manitoba that’s extended to the film industry is really what makes this place different than anywhere else. EDW: Burden of Truth may be set in Winnipeg, but our city usually gets to play other places in movies and TV shows. Talk about the versatility of locations you can find here. KI: This community offers up a variety of looks and feels. It’s easy to do period work because we’ve protected our heritage buildings so well. That really benefits productions that need to shoot over different periods of time. We also have very modern and interesting architecture. More and more you’re seeing building design that brings the outside in, and from a cinematic perspective, the idea of glass between the inside and out offers real spectacular photography. We anchored our second season of Burden of Truth in Republic Architecture on St. Mary Avenue downtown, a brand-new building that’s very much that concept of bringing the outside in and letting the outside see in. Cinematically, it’s just served the show so well. It’s just stunning how good it looks. The other thing about Winnipeg is it’s a hub for the rest of the province so we’re so close to some of the best rural locations that anyone is going to find anywhere. EDW: Manitoba film crews have a reputation for being some of the most professional and talented in the industry. What’s your experience been like? KI: The most unique part of who makes up those crews is they are often artists in their own right. On any given crew at any given time if you go around and talk to people and ask them to tell their story, you’re going to meet musicians, you’re going to meet artists, you’re going to meet people who make their own films. You can come here and not only have people who are experienced technicians but they have that gift of bringing their art to the greater vision of the project. I think that’s a real unique benefit. EDW: Without giving anything away, can we anticipate more shooting days in Manitoba for Burden of Truth? KI: The ratings are up from last year. The numbers are very strong and there’s a good feeling about things. The audience will dictate if we do it again. If they like it and they prove to the broadcaster that it’s important to them, we’ll be back. 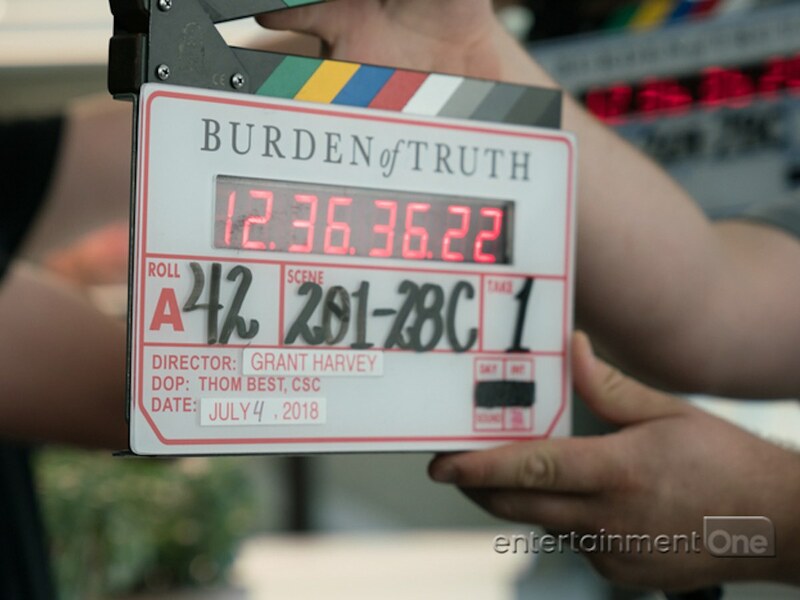 Burden of Truth airs Wednesday on CBC TV and on its streaming platform Gem. It also airs on the CW Network in the U.S. and Universal TV in the U.K. This interview has been edited for length and formatting purposes.